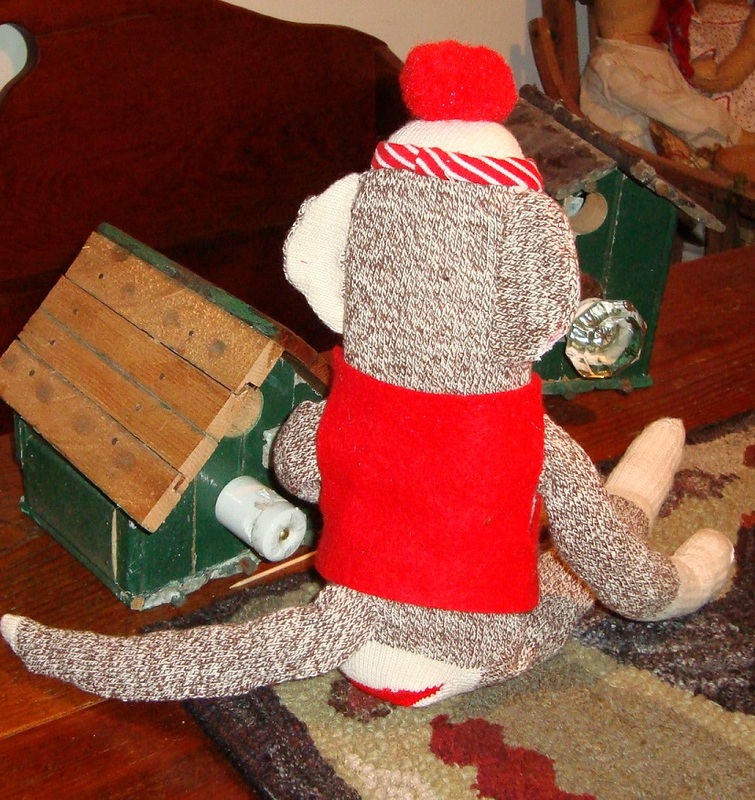 Travelling back in time to childhood, do you remember the sock monkey's granma used to make when you went to visit? Or maybe you never had one in your youth. You can certainly have one now for you to decorate or have for your grandchild. Above is a photo of the front of the Sock Monkey. Below is the back view which I've shown for a purpose.... the back of the ears. It is said that every Persian rug has an imperfection in it because only God can make something perfect. And the olden days in America people used to 'make do' with what they had. And so I'm making my Sock Monkey with both thoughts in mind. 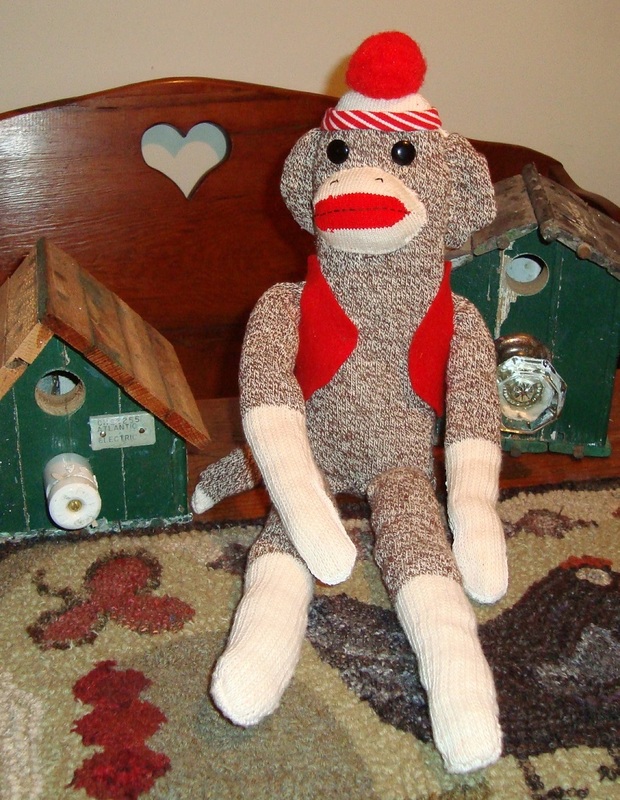 The Sock Monkey measures 22" from top of head to toes and can be yours for $40 plus shipping. Here's Andy, Annie and the thought behind the making of these is that they were made by a granny and her granddaughter. This was a joint effort using whatever pieces of fabric Granny could find and teaching basic sewing skills to her granddaughter. I tea stained them to give the idea of well loved and well played with dollies. Andy and Annie are approx is approximately 21" tall. His hair, appliquéd nose and lips are torn red fabric. Pants are faded blue & white stripe denim. Annie is wearing aged fabric dress, yellow and white gingham collar and bloomers, has red torn strips braids for her hair and red and white gingham bows. Her apron is a vintage hand towel with handiwork. 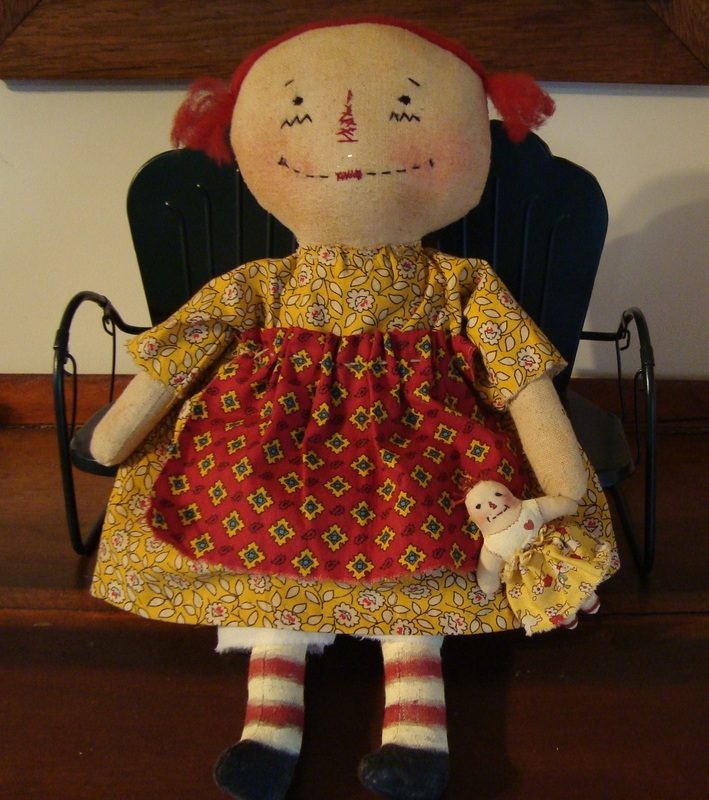 A primitive Annie made using osnaburg cotton fabric which measure 15" tall from feet to top of head. Her facial features are stitched using two strands of embroidery floss and her hair is made with dyed wool roving. She has painted shoes and stripe stockings for legs, body has been tea dyed and lightly sanded for a slightly loved look. She can be yours for $48 plus shipping. Chair not included. Mary Isabella is 16 1/2" tall, made of quality muslin which has been stuffed with fiberfill, two coats of a gesso and modeling paste medium applied and sanded between each dried layer. Then she was painted with acrylics, an antiquing medium applied then a matte sealer. Her dainty needle sculpted fingers and shapely feet and legs are very endearing. 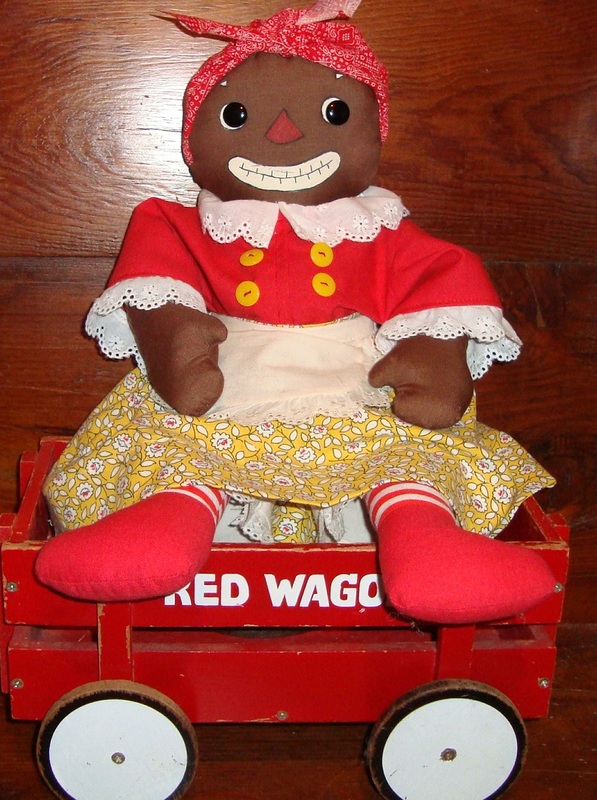 Beloved Belindy is a friend of Raggedy Ann and Andy and was produced between 1938 to 1950. This doll is made using the original Georgette Co. pattern. Belindy is 20" tall, made of good quality cotton, her facial features are a combination of acrylic paints and black button eyes. 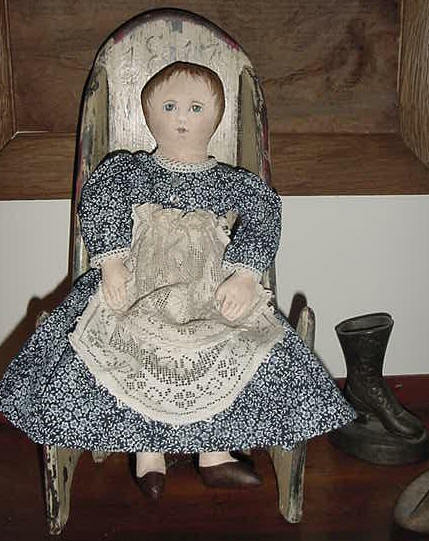 She has been reproduced in color combinations of the most popular Beloved Belindy and has not been distressed to indicate a well-loved and worn doll, but the face has been lightly sanded. The skirt fabric is a reproduction child's design similar to that which would have been a feed sack material. She can be yours for $60 plus shipping. Let me introduce Martha Lou. She was made using a quality heavy cotton duck fabric, with 2 layers of gesso and modeling paste mixture, sanded between applications and painted with oils. She is 14 1/2" in length, has sewn fingers and nails painted lightly on the fingers. Martha Lou's dress is a new fabric but reminiscent of the indigo blue prints that were popular during days of olde. The neckline and cuffs are trimmed in small lace. Her unders are from a vintage hanky and apron is a vintage doily. $65 plus shipping.